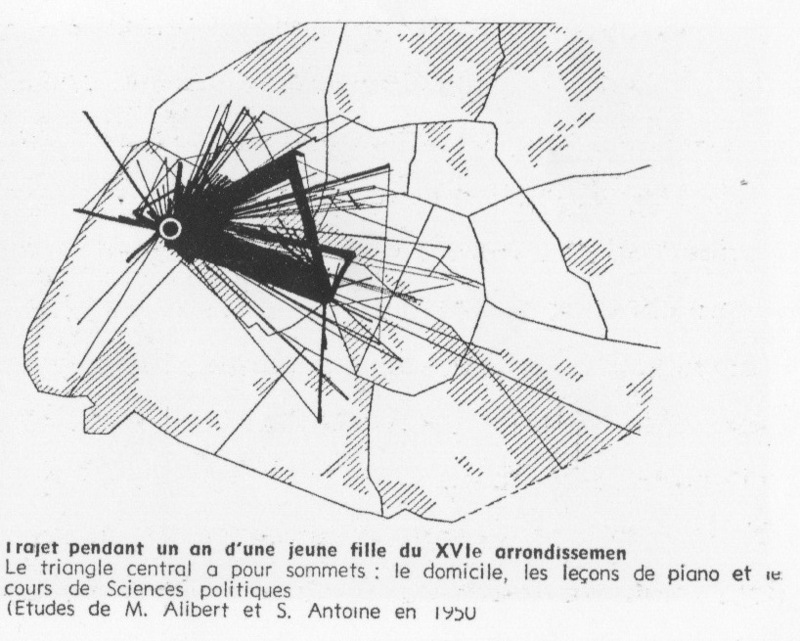 [One year of routes taken by a young woman of the 16th arrondissement; the central triangle has at its peaks: home, piano lessons and classes in political science (Based on studies by M. Alibert and S. Antoine in 1950).] Illustration from Internationale Situationiste 1, June 1958, page 28. Courtesy of Internationale Situationniste. How did walking go from being the most basic of human actions to one rich in potential aesthetic meaning? Today the fable-like jaunts of Francis Alÿs and the audio walks of Janet Cardiff are familiar in the art world, but it took the better part of the twentieth century, with its rapprochement of art and life and the rise of performance art, for walking itself to become art. No history has yet accounted for this paradoxically banal yet radical development. The three movements examined here in previously untapped detail—Surrealism, the Situationist International, and Fluxus—each chose the urban landscape as their site for enacting a revolution of everyday life, and walking was chief among the devices deployed. The central place of walking to these artists offers a vital lesson about the need to approach the city at the level of the pedestrian, if one hopes to engage radically with life. Lori Waxman has been art critic for the Chicago Tribune for seven years. She teaches art history and criticism at the School of the Art Institute of Chicago and has a PhD from the Institute of Fine Arts, New York University. She is coauthor of Girls! Girls! Girls! in Contemporary Art (2011) and Talking with Your Mouth Full: New Language for Socially Engaged Art (2008). She received a Warhol Foundation Arts Writers Grant for her performance 60 wrd/min art critic, which was included in dOCUMENTA (13) and later published as an artist’s book by Onestar Press.